Okay ladies and gents, I'm married to a SPORTS FREAK. Because I'm a super-wife (self named) I gifted the MVP with Miami Heat vs. Lakers tickets TONIGHT for his birthday back in December. 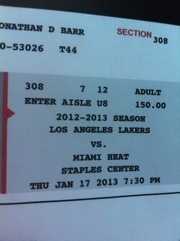 We will be in the presence of ridiculous ANNOYING Laker fans (he he) cheering for Bron Bron loud and proud. People, he's got butterflies to see him in person... No joke. Major man crush and he's got no shame! So get your popcorn ready and enjoy a little tale of HE says SHE says: sports edition. 1. He checks the stats of a game WHILE we're at the game...in the stands...getting first hand updates. WHY? 2. Whenever I ask him to do something his response is ALWAYS, "Yeah, after this play or timeout". Then he forgets. 3. Knowing that vacation days are cut short because two have to be reserved for March Madness. AND, those days are off limits from all conversations, plans, chores, and all husband responsibilities. I get it... Kind of. 5. His specific seat choice in any restaurant is always facing a tv. Oh, those peering eyes! HE SAYS: Here's a list of 5 annoying things about being married to a girl who doesn't get sports. 1. You can't wear the opposing teams colors no matter how cute or new it may be. Save it for the movies, babe. 2. Why do you always want to share your day with me in the last 2 minutes of the game??? Then, it's followed by a "Are you listening to me?" in a not so nice tone. 3. Why do you think we can TiVo the games? It's not an episode of The Biggest Loser or The Bachelor! 4. During the game, I'm your water boy. You know I love you but, why can't you get up? 5. That little sweet voice saying, "Are you really going to wear THAT?" It's a sporting event, all I care about is a good game and a cold beer NOT a stylish "look". Well well well there you have it! We poke fun at each other but it creates a good laugh. We are looking forward to an evening overflowing with hand holding, King James, and big ol' smiles. Following tonight we are JOYFULLY staying at Terranea Resort and Spa with my parents for two nights and ending the trip with two nights in San Diego. Yippee for marriage, family, sports, and beach! Follow me on twitter and instagram to get trip updates! PS: Lebron, he's not the only one with a crush!